Continually refurbished by its designer-owner, this gracious family residence in West County will never go out of style. 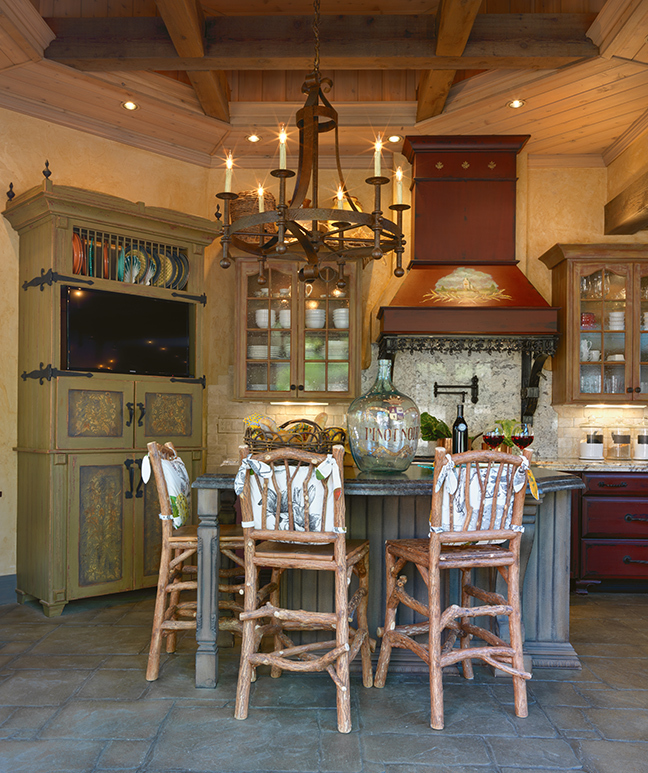 A rich blend of materials and furniture-like pieces give the octagonal kitchen addition its rustic "cucina" ambience. Topped with bullnose ogee granite in a coffee suede finish, the kitchen island complements the wroungt-iron trimmed range hood. The kitchen is fully open to the family dining area, with its massive farmhouse table, and the hearth room, defined by a distressed cedar beam. 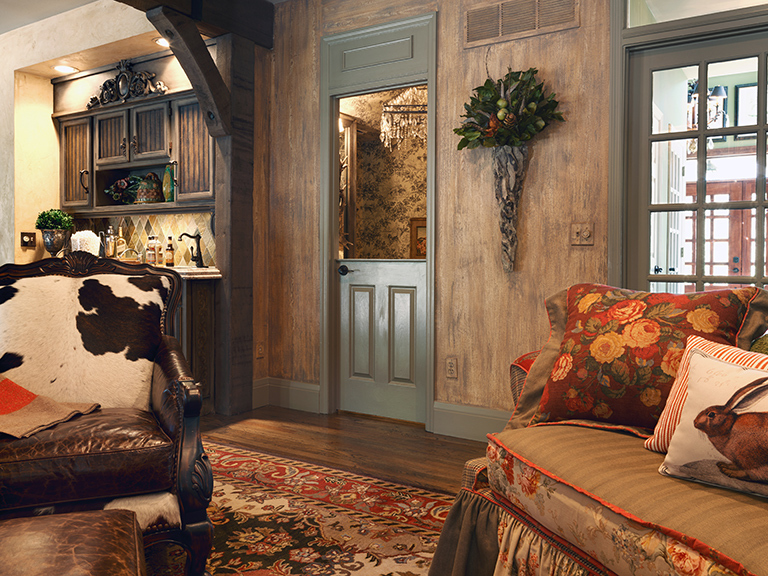 Hair-on-hide armchairs, Ralph Lauren floral upholstery and Provencal scones lend warmth to the hearth room and a Dutch door allows a tasteful view of the powder room's elegant decor. 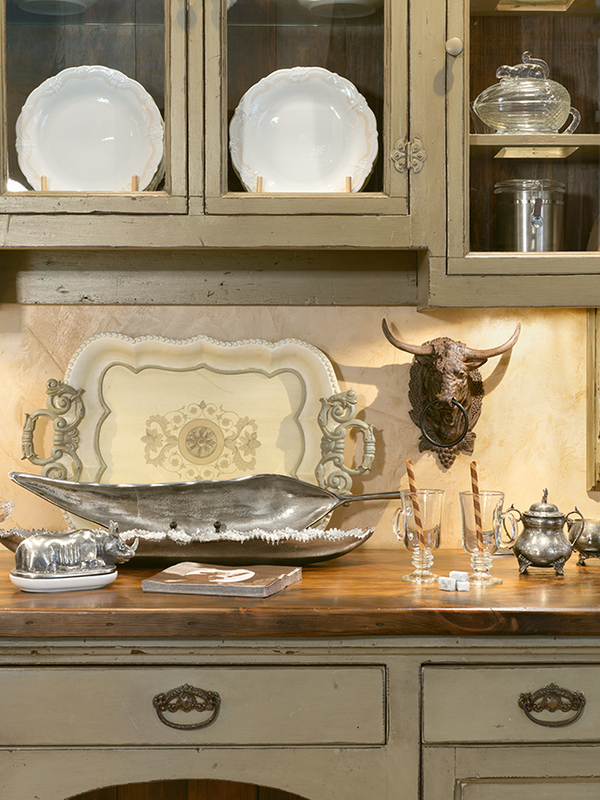 The custom china cabinet is one of the owner's favorite pieces. It is actually two separate pieces integrated by ornate wood brackets. Accenting the farmhouse table are a wrought-iron chandelier and, serving as the centerpiece, a bread dough bowl that once belonged to the owner's mother. Designed for a "casual French feel," the dining room features a gleaming pecan table, painted and distressed French chairs, a crystal chandelier and diaphanous silk draperies. 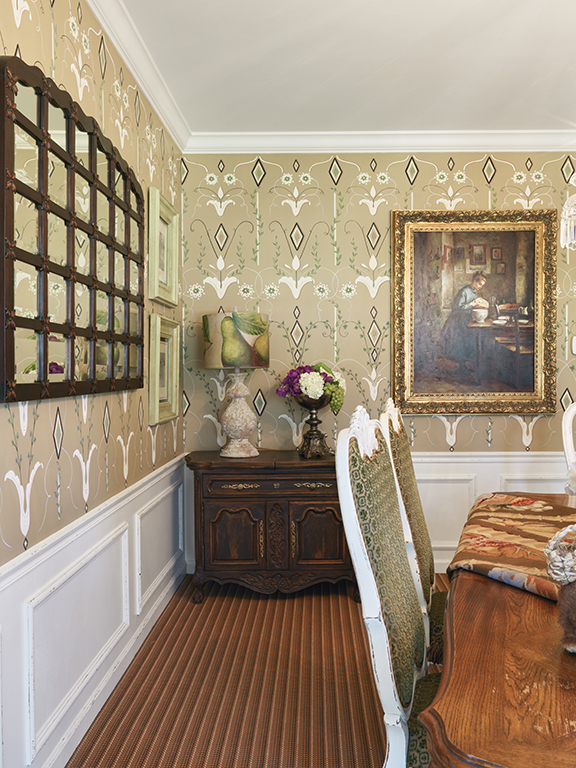 Lightening the dining room's hand-painted walls are picture frame wainscoting, distressed by the owner and a multi-faceted mirror. 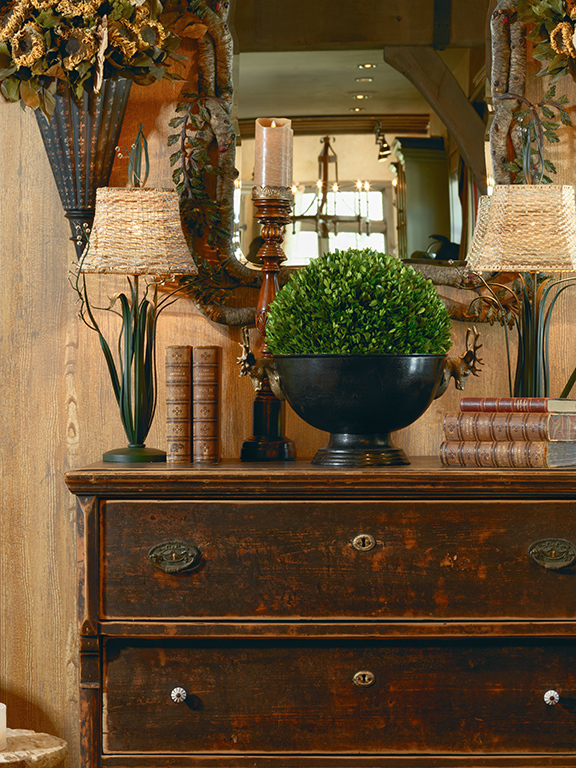 Other accents include a hand-painted lamp, flower-and-fruit filled urn adn a pastoral oil painting. Among the dining room's unique informal touches, the glass panels of the china hutch were replaced with chicken wire, and a settee is situated in the window bay. Raw silk drapes in a loose weave, antlers and canvases painted by the owner enhance the living room's provincial European decor. Referred to by the owner as her "botanical room," the sun-filled 2-story entry foyer showcases 15 framed prints from an old botany book. “Please don’t use the word ‘updated.’ The owners are celebrating their 25th anniversary in this home, and there’s always some amazing project going on, keeping it fresh and new.” That’s designer Heidi Hartwig describing her clients’ spacious custom two-story in Chesterfield. And, as if to punctuate her statement, the sound of hammering upstairs is explained as a “refreshing” of the master bath, currently in progress. 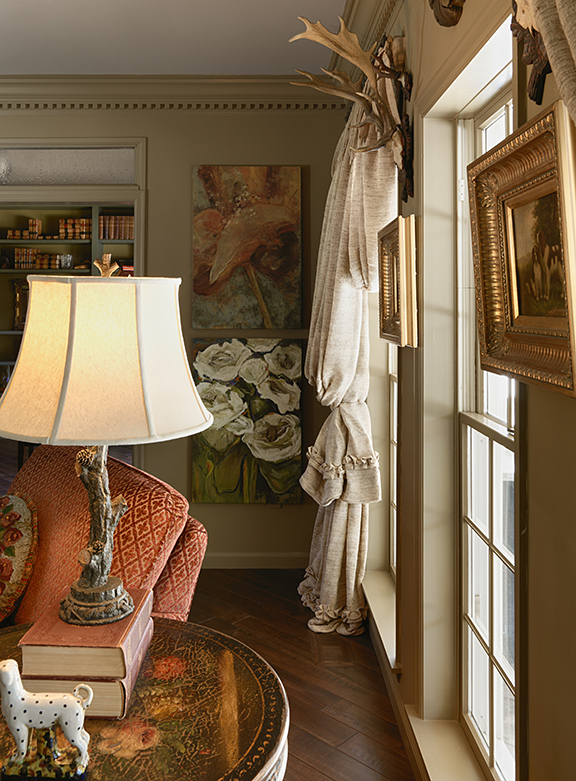 Heidi’s company, Fabulous Finds, is one of several design firms operating as a consortium under the umbrella of The Porch by Nettie White Interiors. The homeowner is a former designer herself, and the house and grounds have been a continual source of inspiration, allowing her to express her creativity in a very personal way. This chapter of the story began eight years ago, when the owners decided to expand their kitchen. 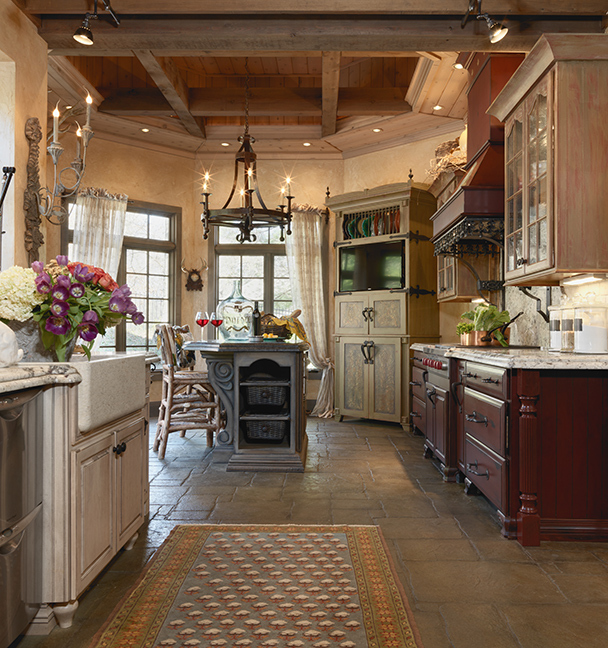 “I wanted a rustic ‘cucina’ look,” says the wife, and her fondness for refined, yet relaxed, European styling is evident in the kitchen’s design. Constructed by the experts at Lakeside, whom the homeowners had a great working relationship, the octagonal turret-like addition is open to the casual dining area and hearth room, topped by an all-wood beamed ceiling, and surrounded by casement windows. The concrete flooring is stamped to resemble paving stones, and textured plaster walls in a warm wheat tone reinforce the sunny atmosphere. Custom-designed by Cabinets Flooring & More and topped with ogee-edged granite from E&B Granite Inc., the center island and base cabinetry are all freestanding. “It gives the appearance of individual pieces of furniture, and the mix of materials adds warmth and interest,” the owner remarks. The kitchen is a prime example of their collaboration. 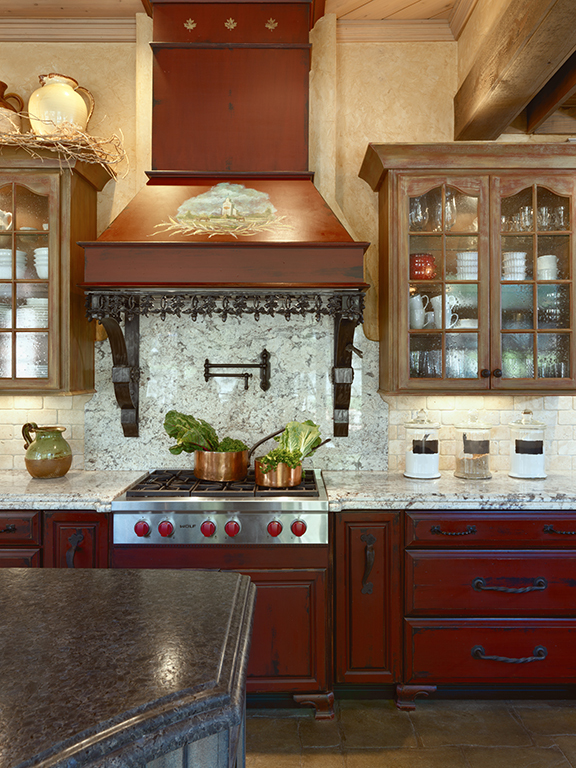 To make the island “more grand,” Heidi suggested adding a sizable corbel, new hardware and decorative panels, which she designed and Nettie White crafted. Their joint efforts were also applied to the kitchen’s English-styled entertainment hutch, which consists of four stacked units with wrought-iron hardware and hand-decorated door inlays. 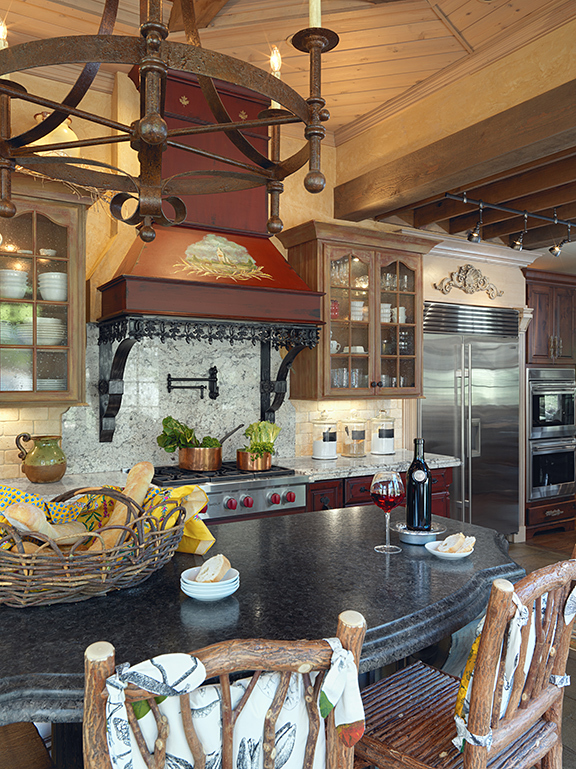 The rich blend of woods, textures and finishes continues into the working area of the kitchen, which is highlighted by a deep country sink set in mushroom-glazed cabinets; vast expanses of mottled cream granite; stainless Sub-Zero and Wolf appliances; and a distressed crimson range hood trimmed with wrought-iron supports and detailing. One of the owner’s favorite pieces is a custom china cabinet in a weathered alder finish (actually two separate pieces integrated by ornate wood brackets), with a lighted display arch and a stained surface. The family dining area is centered by a massive farmhouse table with soapstone inlays and a mixture of seating that combines a wrought-iron bench with dining chairs upholstered in leather and a floral fabric, making a visual transition to the décor of the adjacent hearth room. The homeowner converted a huge bread dough bowl that her mother used to punch bread by hand into a floral centerpiece, which matches the scale of the table. A recent project, the wet bar on the side wall ties the spatial elements together with a stainless wine cooler and icemaker, harlequin backsplash in multi-colored tiles, and custom beadboard finishes by Heidi and Nettie White. Beyond the dining area, the hearth room’s brick fireplace is original to the home, but the soffit had been reconfigured with a distressed cedar beam and braces when the kitchen was expanded. For this space, Heidi chose a more masculine theme – nailhead-trimmed, hair-on-hide leather armchairs; a traditional sofa upholstered in a Ralph Lauren floral the owner has had for many years; and a variety of accent pieces ranging from deer antlers to hurricane candles. Visible from the hearth room is a charming powder room that demonstrates the owner’s innovative flair. 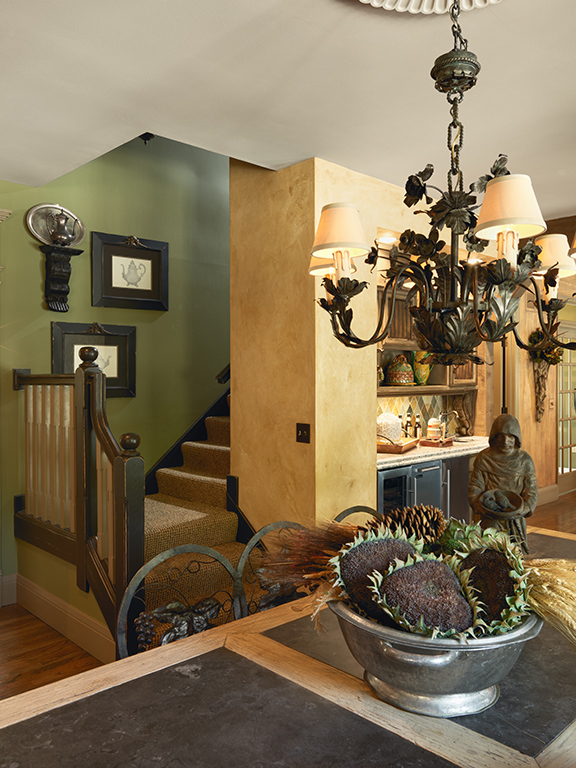 By installing a Dutch door, the top half can be left open – showing off the wallpapered walls and ceiling, crystal-and-wrought-iron chandelier, and large antler-framed mirror – while the lower half remains closed, concealing the plumbing fixtures. 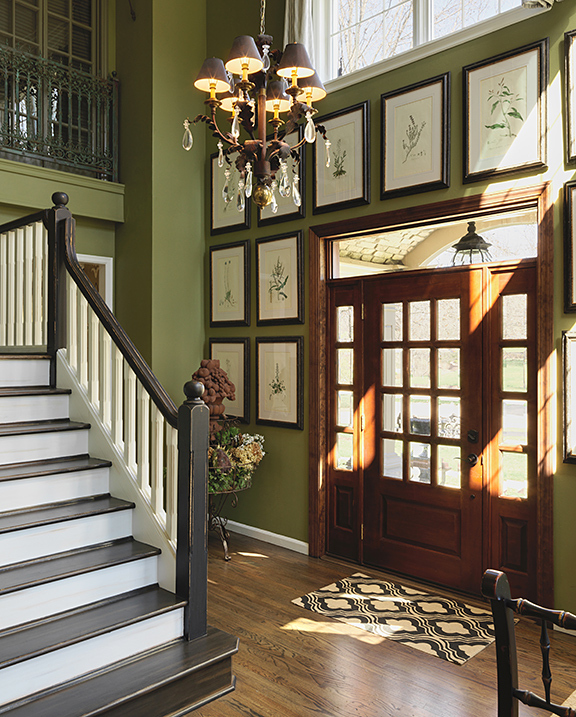 Moving to the front of the home, the owner refers to the two-story entry foyer as her “botanical room.” Banks of windows fill the space with natural light, and the entry door is surrounded by 15 delicate, framed prints that that she found in an old botany book. Flanking the foyer are the formal living and dining rooms, and Heidi added a wicker bench with cowhide pillows, forecasting the décor of the hearth room, which is just visible beyond French doors. 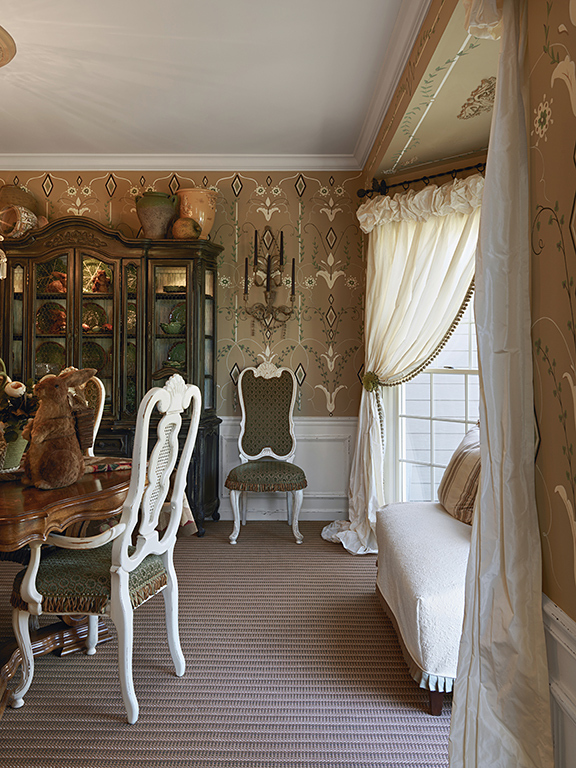 A palette of soft browns, greens and creams establishes the “casual French” ambience of the bayed dining room. 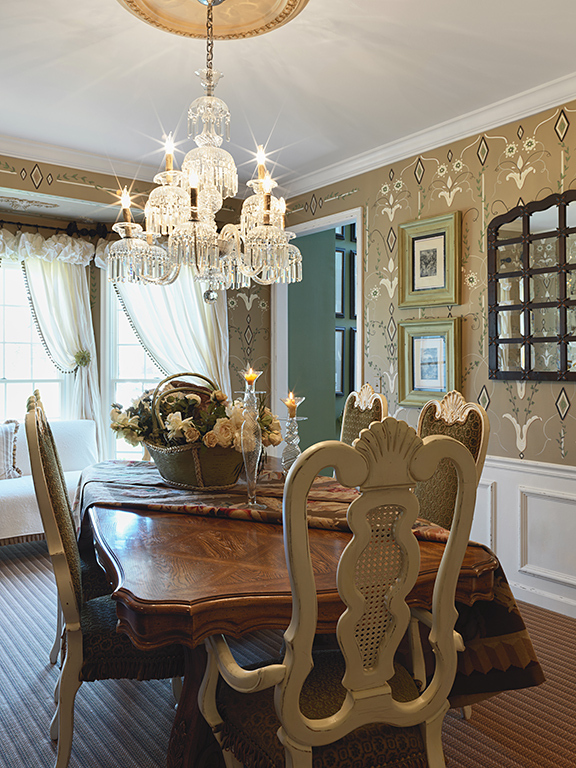 Hand-distressed by the owner herself, picture frame wainscoting complements the hand-painted walls, gleaming pecan table, ornate French dining chairs, silk draperies and crystal chandelier. Unique appointments include a traditional china hutch with the glass removed and replaced with chicken wire and a small settee in the window bay. Virtually all of the draperies and soft pieces throughout the main floor were provided by Williams Upholstery, and the living room windows are lined with raw silk drapes in a loose weave. The sofa was recovered in a soft chenille tweed and the armchairs in a complementary variety of crewel tapestry and sculptured chenille. Subtle accents added by Heidi to maintain the home’s free-spirited European theme include a round cowhide ottoman, a pair of antlers displayed like sconces and a coffee table with the legs painted to resemble wrought-iron, but distressed to allow bits of the original gold to show through. The husband’s office is the one space not subject to constant freshening. He likes the “rustic lodge” décor just the way it is, from the woven grass cloth covering the walls to the bearskin on the floor, his comfy club chair in a Ralph Lauren hound’s-tooth plaid, and the easel displaying one of his wife’s own paintings. Over time, Heidi and the owner have a developed a warm working relationship that reflects their genuine appreciation of each other’s talent and creativity. And with 6,000 square feet of living space, four bedrooms, six baths and a fabulous outdoor living area, this elegant residence is likely to keep the two designers busy “refreshing” for years to come.